Remodelista & Gardenista Considered Design Awards. 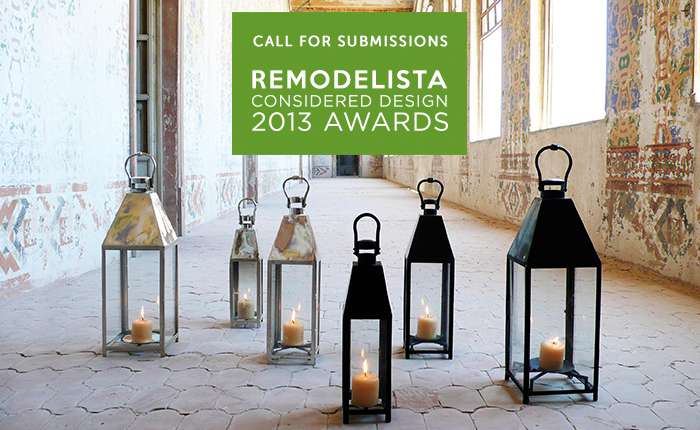 Remodelista is inviting its dedicated readers to submit their successful personal design endeavors for its first Design Awards. All kitchen, dining, bedroom, bath, and office projects are welcome for submission. For outdoor enthusiasts, Gardenista is searching for projects in five other categories. Judges will select up to five finalists in each category and then readers will vote for their favorites. Winners will be featured in a post and will receive a hand-wrought iron Symi Lantern in black matte finish with a hand-stitched leather handle from Casamidy. The Connected City Design Challenge. The Connected City Design competition seeks daring design ideas that will link Dallas’ Downtown and Trinity River. The designs must confront and overcome the area’s current physical, psychological, and economic separation. The city’s main urban areas are experiencing a rebirth and rejuvenation, but no natural or inviting way of connecting Downtown to the planned Trinity River Corridor Park exists today. The Connected City Design Challenge, produced by the Dallas CityDesign Studio, is a competitive process with categories for professionals and non-professionals. Sunbrella Future of Shade Contest. The world’s leading performance fabric manufacturer Sunbrella invites architects and designers to design a proposal that shows how the durable material changes the way people think about building and space design. Size is no issue, but the project must demonstrate an innovative use of Sunbrella fabric to offer protection from the elements or to highlight a building’s aesthetics. Winners could win $10,000 in cash and some of the designs will be showcased at AIA in Denver and at IFAI in Orlando. Architizer will showcase the strongest ideas to millions of readers and social media fans. Next Landmark 2013. Floornature international architecture and urban photography contest Next Landmark 2013 is open to architects, engineers, landscape architects, urban planners and designers who graduated after 1st January 2000. Whether an entrant’s forte is architecture or photography, the competition gives first works and architectural research visibility through web initiatives and events. There will be one winner in the First Work, Research, and Photography categories and two honorable mentions per category. Along with other prizes, Next Landmark 2013 will take the winners to Helsinki Design Week. Water Index. Combating climate change is an increasingly pressing matter. The University of Virginia School of Architecture is searching for visions for the future of water. Submissions will be considered for inclusion in an upcoming book on the topic called WATER INDEX. The book will highlight promising and provocative solutions for the future of water and civilization. Projects must recognize and challenge 21st-Century water issues and will be categorized into three conditions: The Rising, The Contaminated, and The Disappearing.